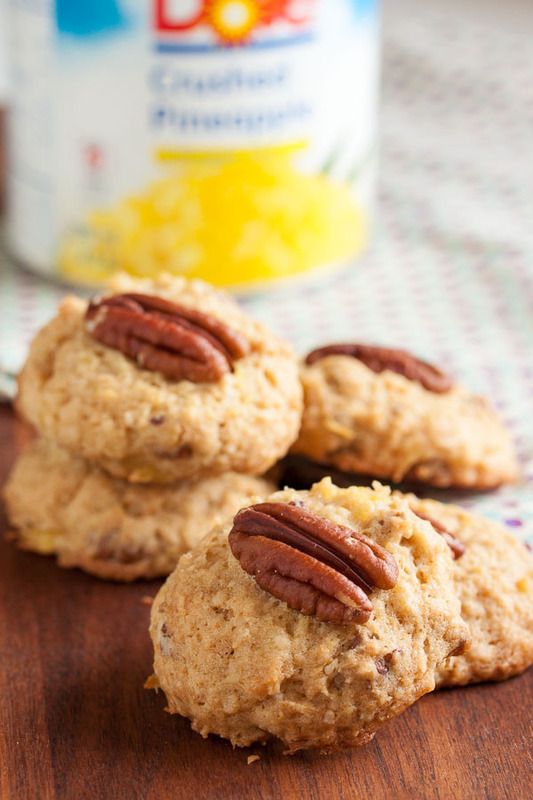 Hawaiian Pineapple Pecan Cookies | wanna come with? 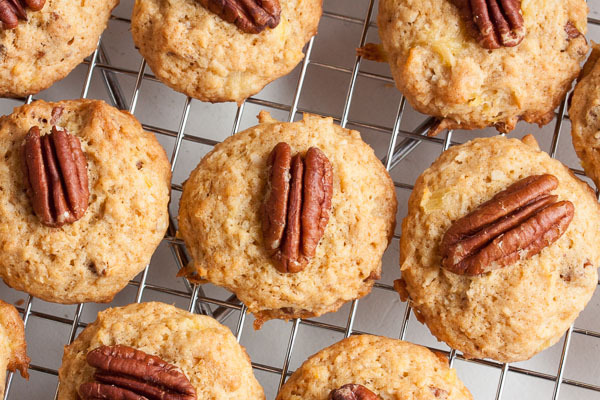 This week’s cookie is a festive tropical combination of pineapple, coconut, and crunchy pecans. I’ll admit, I had a few issues with the recipe. But don’t get turned off, because the final result is fantastic. I ended up eating way more than my share of these cookies, and they were really popular with all my coworkers. This cookie is definitely a winner. 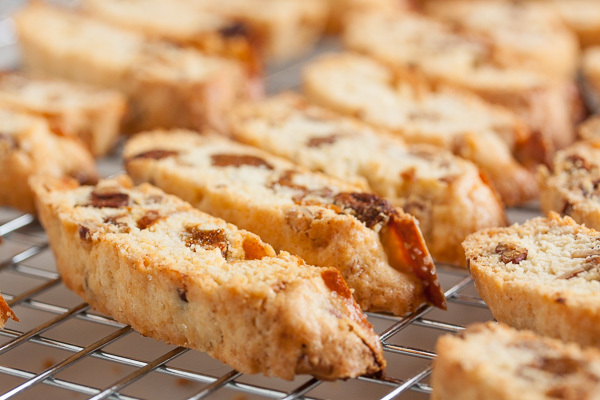 Maida Heatter is an institution in the world of baking. She’s been around since the 70s and is the recipient of multiple James Beard awards (that’s pretty fancy). When I first saw this book in the bookstore, I bought it without even flipping through the pages, I was that certain it would be good. I’ll admit, at first I was disappointed that there were no photos – at all. But I was confident I was getting some good solid cookie recipes. Unfortunately, the very first recipe I tried had a pretty major typo in it. The ingredients called for a whopping 10 cups of oatmeal. No way could that be right. I managed to track down another copy of the same recipe from one of her other cookbooks which listed a much more reasonable 1-1/2 cups of oatmeal. Not a great introduction to this book. But since then, I’ve made several other recipes from the same book without issue. So maybe I just had the bad luck to try the one recipe with a typo? And then I came upon this one. I decided to make it based on the ingredients list alone and just had a quick skim through the recipe to make sure there weren’t any weird instructions that might trip me up. When I got ready to bake, I read through the instructions more carefully. And hit a snag. The ingredients list an 8-ounce can of crushed pineapple. There are instructions to drain the the pineapple, saving both the juice and the pineapple, which makes me think we’ll need both. Nope. Further on, it just says to add a single tablespoon of pineapple. That? That makes no sense. 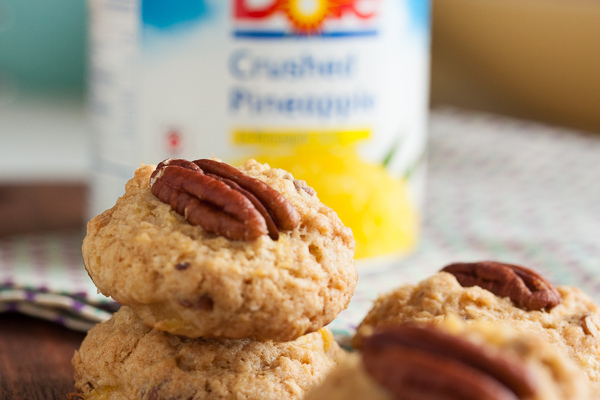 For one thing, how can you call this a “pineapple cookie” when there’s only a single tablespoon of pineapple in the entire recipe? Secondly, why bother listing an 8-ounce can in the ingredients, and then specifying in the instructions that you should have 2/3 cup of drained pineapple which you then don’t even use? Both of those measurements are completely pointless if you only need 1 tablespoon. And why bother noting that you need to save the juice? What I suspect is that you should add all the pineapple plus 1 tablespoon of the juice. Doesn’t that make more sense? That makes sense, right? So of course I googled to see if anyone else has made this recipe. I could only find one person who’d posted about it, though, and she mentioned that she used the full can (which she said wasn’t quite 2/3 cup), and it sounded like that’s what her copy of the recipe called for (unfortunately for me, she didn’t post the entire recipe). I began to doubt myself and read through the recipe again. And again. And again. Still just 1 tablespoon. The other blogger also said that the pineapple flavour wasn’t very pronounced, and was almost like an afterthought. Hmmm. Normally the first time I make a cookie, I’ll follow the recipe as-is. But since this one already didn’t make sense, I decided to just throw caution to the wind and follow the other blogger’s example. But, well, here’s the thing. I couldn’t find an 8-ounce can of crushed pineapple – I had a 14-ounce can. And since it sounds like 8 ounces apparently wasn’t pineapple-y enough… yup, I decided to use the entire 14-ounce can. And while we’re winging it, I also decided to add some coconut, because when I first saw this recipe, I thought it would be even more Hawaiian-y with coconut added. To cut to the chase, they turned out amazing. Seriously. The texture is fantastic (the coconut was a good addition! ), and you can definitely taste pineapple, as well as the coconut and pecans, plus a hint of citrus. This? This is a good cookie. As for the cookbook, I’ll continue baking from it, but with caution. 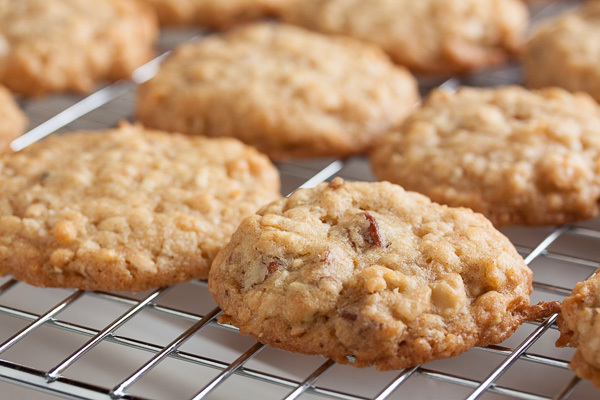 Adapted from "Hawaiian Pineapple Cookies" from Maida Heatter's Cookies. The original recipe says it makes 30 cookies, but I got 52 using my usual slightly larger than tablespoon-sized cookie scoop. Using a sieve set over a small bowl, drain the pineapple, pressing gently to extract most but not all of the liquid. You'll only need 1 tablespoon of the liquid, but you can save the rest for another recipe (maybe some piña coladas?). 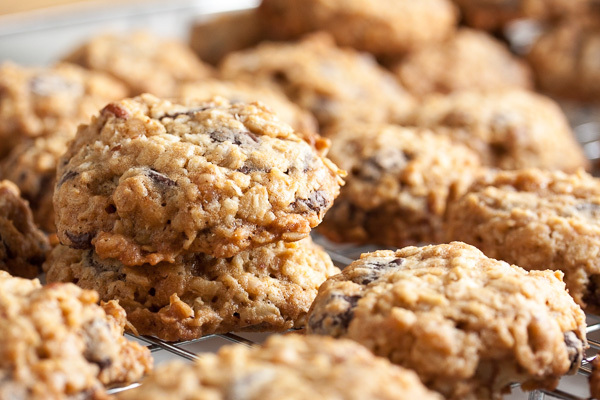 In a medium bowl, whisk together the flour, coconut, baking soda, baking powder, and salt. Set aside. In the bowl of your stand mixer, combine the granulated sugar and lemon zest, rubbing them together with your fingers until the zest is distributed and the sugar is fragrant (the original recipe called for the zest to be added later, but I learned this method from Dorie Greenspan and prefer it for avoiding clumps of zest). Add the butter and brown sugar and beat together on medium speed until light and fluffy, about 3 or 4 minutes. Scrape down the sides of the bowl and add the egg, beating well. Add the drained pineapple and 1 tablespoon of the juice. Beat until incorporated. Turn the mixer down to low and add the dry ingredients, mixing until just barely combined. 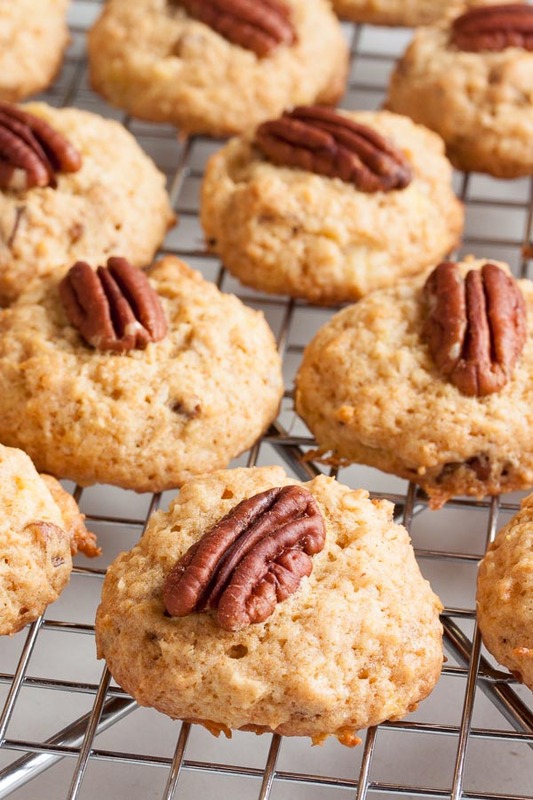 Remove from the mixer and add in the chopped pecans either with a spatula or by hand. I prefer to knead inclusions in by hand to ensure they're distributed evenly. 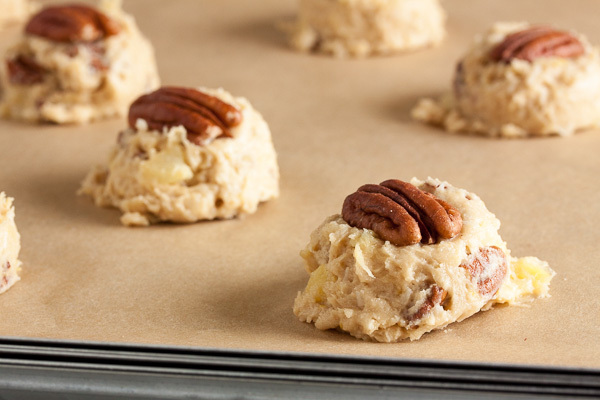 Place a pecan half on the top of each mound of cookie dough, pressing down slightly.